Surely my readers have used this recipe before because it is a traditional family dish, very popular in the United States. I thought I’d put it because sometimes you may need a hearty meal and also because it definitely appeals to children. 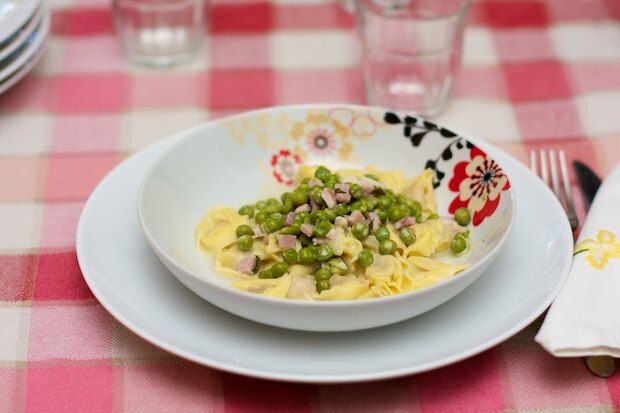 The perfect success of this dish depends crucially on the quality of the ingredients. It’s an opportunity to use a big bag of frozen peas, taking out only the amount you need, and leaving the remainder in the freezer. This way you will have extra peas at home to use for other preparations. The tortellini I use are the ones with prosciutto crudo from the brand “Giovanni RANA”. Bring a pot of water to a boil with some salt for the tortellini. Add the olive oil and thinly sliced shallots to a sauté pan, saute for a few minutes, then add the peas, salt and pepper. Cover with a lid and continue to cook. After about 15 -20 minutes the ingredients will be cooked. Add the diced ham to a pan and sauté, moving it with a wooden spoon. After about 5 minutes, add the peas and thinly cut parsley, and finally, the cream. Heat one minute and then turn off the burner. Cook the tortellini according to the instructions on the package then pour it into individual dishes. Over each portion, pour a little sauce and a tablespoon of parmesan. 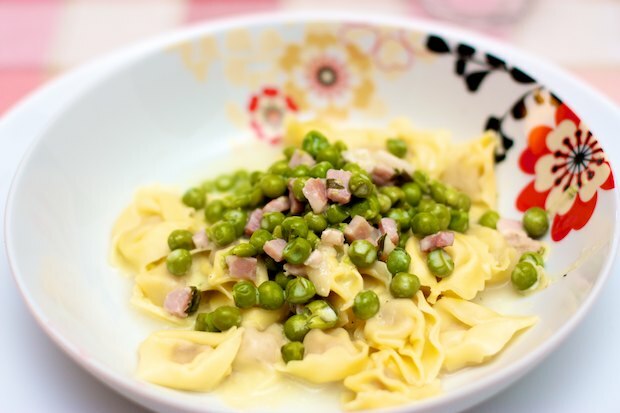 Posted in Pasta and tagged with Tortellini al Prosciutto e Piselli, Tortellini with Ham and Peas. RSS 2.0 feed.